← Partisan (?) science continued. Reflections on Hurricane Florence…human nature…and the Ulysses pact. All that seems to have been reflected in local-, state-, and federal actions, and the resulting public response. Evacuations have been underway for days. Hundreds have had to be rescued from their homes after the rain and winds made landfall – but not many thousands. Of course it’s early-on in the event; the fullest impact of Florence – especially that following the flooding – has yet to be felt. But that’s the subjective impression for now. We continue to struggle, however, as individuals and as society, with the larger challenge of managing weather risk. At the last minute, we scurry out of harm’s way, as best we can under the chaos that is constant companion to imminent threat. But we make poor choices with respect to where and how we build, where we locate and how we protect critical infrastructure, how we dispose of waste, and other long-term choices and decisions that compromise our resilience for years into the future. Evacuation by no means makes us whole. Myopia:We focus on the short term and have difficulty understanding long-term consequences, such as the 100-year flood. Amnesia: We forget the past. We buy a condo in complex built where a storm once blew away a shopping center. Inertia:We do what we’re doing until something drastic happens, when it’s too late. See New Orleans and Katrina in 2005. Selectivity: We don’t look at all the information, or simplify to the point of inaccuracy. If we have an emergency checklist, we lose interest after covering a few items, without making sure they were the most important. Herding: We make choices based on what the other person is doing. And so we both wind up treading water. 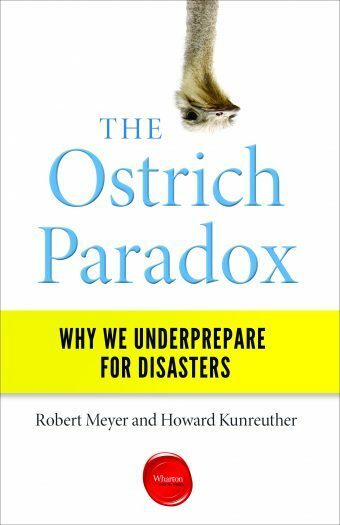 Optimism: This most American of traits leads us to underestimate risk, ignore worst-case scenarios and think bad things will only happen to others. It’s a great attitude for someone starting a business, not so much for someone living in a flood zone. The fuller book expands on these and gives context. We would recommend that instead of thinking about just the long term with respect to this, there are two things that one can do. One is, you might give a person a loan to help them out and spread the cost over time. The other thing to deal with is the “it won’t happen to me.” Instead of saying, “It’s going to be a one in 100 chance of a flood occurring next year,” stretch the time and say, “Think about the fact that there might be a hurricane in the next 30 years, and that likelihood is greater than one in four, or one in five.” Then, people will think about the long term and maybe decide that they can take some action. Arguably, the greatest opportunities, the most likely to work real-world, would seem to lie in social measures – in policies – versus individual actions. This ought to be true for two reasons. First, to be personally resilient in a brittle but interconnected world is an oxymoron. That line of thought starts with going off the grid, then progresses to moving to Idaho or Montana, then … to ever more extreme and self-evidently bankrupt measures. Better to put handcuffs on ourselves, metaphorically speaking, with respect to risk management. This might seem extreme, but we do this all the time in life to good effect: agreeing to drive on the right side of the road; instituting and obeying speed limits; settling on 110-120 volts 60-cycle AC electrical power; ISO 9000 standards; and more. We even do this in the hazards arena, most notably in aviation. Similar ideas have been with us since antiquity, in the form of the so-called Ulysses pact. From Wikipedia: A Ulysses pact or Ulysses contract is a freely made decision that is designed and intended to bind oneself in the future. The term is used in medicine, especially in reference to advance directives (also known as living wills), where there is some controversy over whether a decision made by a person in one state of health should be considered binding upon that person when he or she is in a markedly different, usually worse, state of health. The term refers to the pact that Ulysses made with his men as they approached the Sirens. Ulysses wanted to hear the Sirens’ song although he knew that doing so would render him incapable of rational thought. He put wax in his men’s ears so that they could not hear, and had them tie him to the mast so that he could not jump into the sea. He ordered them not to change course under any circumstances, and to keep their swords upon him and to attack him if he should break free of his bonds. Upon hearing the Sirens’ song, Ulysses was driven temporarily insane and struggled with all of his might to break free so that he might join the Sirens, which would have meant his death. Time to get our heads out of the sand. Coincidentally, Mike Smith sent me a link to his reflections on this subject just moments ago. Just one example of hundreds driving home the point that weather information infrastructure undergirds and enables a range of individual efforts.